This would seem like an awkward mix of topics, but hopefully I can convince you of the similarities. The connection occurred to me recently, as I have been tutoring a student for theory and sight-reading in preparation for a grade 4 AMEB violin exam. (The AMEB is the Australian Music Examinations Board, a bit like the local Aussie version of the ABRSM, which is a world-wide music education organisation). In addition to preparing a set of pieces for performance, the student sitting the exam must also answer questions relating to music theory and history. I have only ever taken one AMEB exam in my life, so I don’t know exactly what kinds of questions are asked during a typical exam. Based on this student’s learning materials, I can deduce that, at this early stage in the progression of grades, they are likely to be questions regarding the fundamentals of music history and analysis, such as: “What is a concerto?”; “What is the form of this movement?” (binary, ternary, ritornello, and “through-composed” are the expected possible answers at this grade — sonata form comes later! ); “The music of Mozart is representative of which period of music?”; “You just performed a piece by Handel, can you name some other pieces by Handel?”; “What does allegro moderato mean? ; and so on. This is not particularly challenging. A student who is curious and motivated will probably know the answers already, via searching on Wikipedia and other sources on the internet. These basic concepts of Western classical music may also be covered in high school music classes, if the school is fortunate enough to provide them. For the average student, these facts can be imparted easily by the teacher during a lesson, with the additional advantage that explicit examples from the music being practised may be used. With a little more effort, the fundamental concepts of musical analysis and theory can be similarly acquired, or else taught in the lesson too. Remember, at this early stage (grade 5 or below), the student only needs to recall the basic facts. The student wasn’t able to give a reply! He could not identify C major, and so I had to start at the beginning. Over the next 4 lessons, I introduced the concept of major and minor scales, the rudiments of the Western system of tonality (key signatures and the circle of fifths), and also the names of intervals. He had particular trouble grasping the fact that the terms major and minor can describe a scale, a key, and also an interval (which might be a comment on the language we use to describe music… or my teaching skills, or both). An experienced musician will know at a glance that all 6 excerpts are just different manifestations of the basic C major chord. The notes C – E – G form the C major chord regardless of the order of the notes, the register, and the rhythms used. Numbers 1 to 5 are just examples I’ve cooked up on the spot to illustrate some commonly used figurations, but number 6 is actually the opening of a piece of chamber music by Mozart (+10 cool points if you know which one!). One does not need to have practiced those particular figurations in order to execute them, it is about recognition of a broader pattern, and being able to adapt to variations on the basic pattern. This brings us to a brief discussion of sight-reading, another component of the AMEB exam. One of the most remarkable features of Western classical music is the complex system of notation that has been developed over many centuries. Improvisation used to be an integral part of Western classical music, but generally it has lost its prestige in our era. Although there have been many successful efforts (e.g. historically informed performance, modern compositions which include improvised sections, and cross-overs with jazz and folk traditions) to reintroduce it as part of the classical musician’s skill set, I think it is safe to say that most classically-trained students are not taught improvisation. There is hence a strong emphasis on being able to read and interpret notated scores. Sight-reading is the practice of performing a score which has not been prepared beforehand. Since playing a musical instrument is so demanding, sight-reading is not a trivial exercise, and techniques must be developed. The minimum requirement is simply to be able to reproduce the notes and rhythms faithfully, within some reasonable margin of error. At higher levels of examination, students are expected to also pay attention to different articulations, dynamics, and expressive markings on the score. I would argue that the first step is the most difficult. Translating a single note that is written on paper to a sound on the instrument (this includes the human voice too!) requires the musician to identify what pitch is represented by the notation, then to engage whatever physical actions are necessary to produce that pitch on the instrument. However, in order to play a passage of music, one must also be able to take into account the rhythm (roughly speaking, the relative durations of notes), as well as the succession of pitches, and translate all of that into a fluent process on the instrument. There is no hope of attaining the fluency required by considering single notes at a time. Experienced musicians will be able to internalise larger chunks of music, say an entire bar or several bars at a time, and also be able to read ahead, so that while they are playing a certain passage, they are mentally prepared for what comes next. Thus, to successfully perform even a simple piece of music at sight, the reproduction of the notated pitches and rhythms should be second-nature, as effortlessly as a literate person can read and recite written text (which is the motivation behind my choice of words “translate” and “fluent”). Attention to articulations, dynamics, and expressive markings can be trained later and often comes naturally with experience, but it is the fundamental, near-instantaneous connection between notation, sound, and physical action that is difficult to master, and requires diligent practice and time commitment. I find that it helps tremendously if the student already has some knowledge of the Western tonal system — the rudiments of scales and keys — and a decent sense of rhythm. In this case, the bare essentials of a piece of music can be quickly internalised, and sets a rough framework or guideline during the sight-reading. As the student further develops their sight-reading skills, they will be able to transform the “passive” knowledge — e.g. recognising that a piece is in a given key — quickly into “active” knowledge, that is, knowing how to realise the notation as sound on the instrument. When I see a notated pitch, I can instantaneously hear the said pitch (unless it’s in some strange transposition! ), and if it is violin music I am reading, I also immediately ‘feel’ the correct position of the fingers even without the instrument on hand. This is the fundamental connection I described above, and I’m sure all highly-trained musicians can experience it. (Click to see larger image). A difficult but worthwhile endeavour is to develop the sight-reading of four-part harmony. This is essential for anyone needing to grasp the harmonies of a piece of music quickly, and is good training for score reading in general, especially for chamber music and orchestral scores. Here is one of J.S. 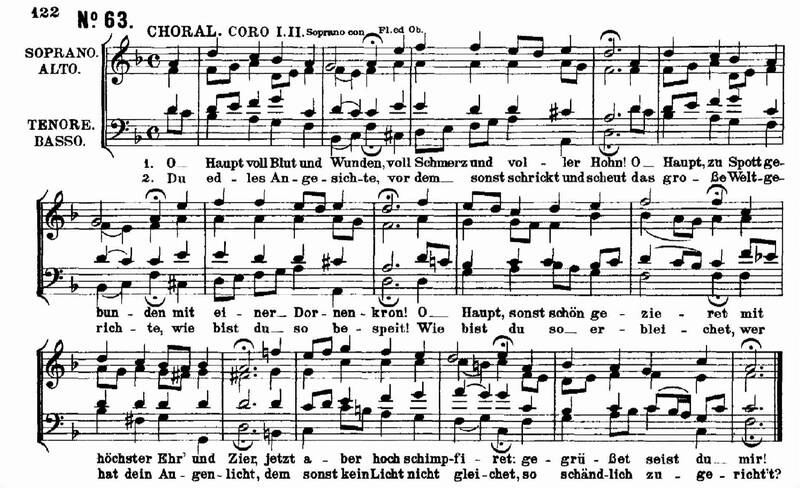 Bach’s most exquisite chorales, from the St. Matthew’s Passion. The idea isn’t necessarily to be able to hear everything at once, but to internalise enough to understand the harmonic progression. I suggest starting with just the soprano melody against the bass notes. Another helpful study technique might be to copy out individual lines and sing through them. That way, you also get to appreciate Bach’s wonderful voice-leading. Enjoy! Unfortunately for my student, before our lessons, he lacked the knowledge even to recognise basic features like tonalities and intervals, and hence, as his mother had described to me, was practically unable to do sight-reading. After the limited number of sessions we had before his exam, I feel confident that he can now recognise key signatures and tonalities appropriate for the grade 4 level, but unfortunately we did not have enough time to make significant progress in putting this knowledge into action and developing his “inner ear” (referring to the connection between the notation and sound, not the anatomical inner ear). Nevertheless, I hope he has grasped the basics quickly enough to allow him to score some points in the sight-reading component of the exam. It is at this point that I bring in the relationship with studying maths. This is actually more of a probability question, but I think part of the reason it was considered difficult is that the resulting quadratic equation appears (at first glance) to have no connection with the other information. In fact, the question could have been more challenging if the students were simply asked to “find the value of n“, it was quite kind of the examiners to provide the correct quadratic equation! The point is that the question combines two topics — basic probability and quadratic equations — that when considered individually should have caused no problems for a student who has adequately prepared for the exam. But of course, interesting mathematical problems are interesting precisely because the techniques needed are not handed to you on a silver platter, and the road to the solution is not paved nicely and marked with flashing signposts. There is no huge conceptual leap from typical textbook exercises to Hannah’s sweets, but students who are too accustomed to the textbook fail to adapt the basic techniques to tackle more interesting problems that require a more involved process. (Previously, I have discussed briefly the role of creativity in mathematics). As I continue my mathematical studies at the University of Sydney, I come to realise the utmost importance of complementing the theory explained in lectures with a rich variety of problems to tackle, so that I begin to appreciate the myriad of ways the theory is used in practice. Interesting and challenging problems will often require creative manipulations, finding connections between different concepts, expressing the same quantity in different ways, combining the results of various theorems in a clever way, and so on. The temptation is to consider yourself a master after getting all the textbook exercises correct. Sure, you understand the basic theory, but this is only the beginning! It is likely that most of the students who complained about the GCSE question were perfectly capable of solving quadratic equations, but floundered when the technique was disguised in a more creative way. The converse seems to be true in the case of my AMEB student. He had diligently prepared four specific pieces, but lacked the techniques required to appreciate and process music more generally, as demonstrated by his initial inability to sight-read music. In mathematics as in music, it is most satisfying when you begin to appreciate the interaction between theory and practice. There are two solutions (as expected from a quadratic), n = -9 and n = 10, but clearly you can’t have minus 9 sweets (unless all the sweets in Hannah’s bag are stolen and she owes someone 9 sweets! ), so the only valid answer is n = 10.
to blogosphere, brief and exact advice… Thanks for sharing this one.